When you create a one-to-many relationship between two entities in Code First Entity Framework model, you need to set “links” in both entities. In my case they are Client and Phone entities. During the migration EF will create a field Client_Id (entity name + field name of the primary key) and a foreign key. I don’t like auto-generated names for table fields and I want to get a precise control over it. For example, I want to give another name for a foreign key field, say, ClientId without underscore. EF allows to do this with a couple of lines of code. You need to add a ClientId property and a ForeignKey attribute pointing to ClientId. To be frankly, that’s my favorite way to declare a relationship. Another case is when you need to create two or more relationships between the same two entities. At this time you must set an InverseProperty attribute in Client class, or you’ll get 4 fields and foreign keys instead of 2 required. Now we get the following structure. Please pay attention that auto-generated fields Client_Id and SecondClient_Id are null. 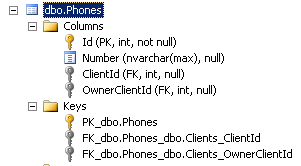 When I placed ForeignKey attributes in Phone class to replace the auto-generated names with my own, I’ve got an error on Update-Database phase. 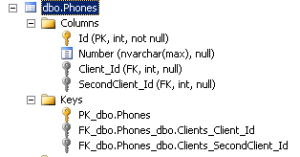 Introducing FOREIGN KEY constraint 'FK_dbo.Phones_dbo.Clients_OwnerClientId' on table 'Phones' may cause cycles or multiple cascade paths. Specify ON DELETE NO ACTION or ON UPDATE NO ACTION, or modify other FOREIGN KEY constraints. The other option is to change manually the database migration .cs file and set cascadeDelete to false.